Mary set out and went with haste to a Judean town in the hill country, where she entered the house of Zechariah and greeted Elizabeth. Today, the church in the Americas celebrates the visitation of the Mother of God to an Indian, Juan Diego, on a hilltop in Mexico. Twice he receives a lukewarm reception from the bishop. Mary had gone in haste to her cousin Elizabeth’s and then went out to meet Juan Diego on the road. Mary shows us a God, the God she bore in her womb, who goes out to encounter the other, especially those in need. She reaches out to the poor, the outcast, the nothings of this world. What a contrast to what a friend experienced a few months ago. He went to a government office to ask for help to get some soil samples tested. He was told that they didn’t have time for him. In contrast, Mary takes time for the other, for us, and especially for the poor. Our Lady of Guadalupe is a challenge to us to take time for others, especially the poor, to welcome those who are without power, who are despised by the rich and powerful. When the image of the Virgin appeared on the tilma of Juan Diego, it was the prophecy of an embrace: Mary’s embrace of all the peoples of the vast expanses of America — the peoples who already lived there, and those who were yet to come. Mary’s embrace showed what America — North and South — is called to be: a land where different peoples come together; a land prepared to accept human life at every stage, from the mother’s womb to old age; a land which welcomes immigrants, and the poor and the marginalized, in every age. A land of generosity. 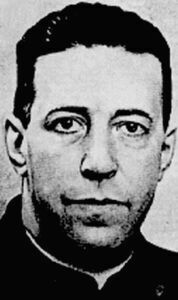 Today is the feast of the Chilean Jesuit Alberto Hurtado who lived between 1901 and 1952. He combined in his life a deep spirituality, a commitment with the poor, and participation in the struggle for justice, based in his faith. He founded El Hogar de Cristo for homeless and abandoned children; he helped found a Christian labor union movement; he started a periodical to explain Catholic Social Teaching. I have written about him in earlier posts here, here, and here. Fr. James Martin, SJ, has a reflection on St. Alberto on the America magazine blog here. I came across a prayer of his that I think deserves sharing. My English translation is followed by the original in Spanish. If you give me fortune, don’t take happiness away from me. If you give me strength, don’t take reason away from me. If you give me success, don’t take humility away from me. If you give me humility, don’t take dignity away from me. Help we always see the other side of the medal. for not thinking like me. nor in despair if I fail. is the experience which precedes triumph. Si yo fallara a la gente, dame valor para disculparme. Si la gente fallara conmigo, dame valor para perdonar. Señor, si yo me olvido de Ti, no te olvides de mí. When I die, I’d like John 12: 20-26 read at my funeral. they will lose their lives. it is worthwhile to be a Christian. to be fruitful like mine, do as I do. Be converted into a seed that lets itself be buried. Let yourself be killed. Do not be afraid. Those who shun suffering will remain alone. No one is more alone than the selfish. you will reap a great harvest. Do not fear death threats; the Lord goes with you. I also want this quote read at my funeral, since it has been central to my understanding of God’s call for me – even before I came to Honduras. I think it was important for Monseñor Romero who used a shortened version of this in his last homily, on March 24, 1980, moments before he was martyred at the altar as he finished his homily. Losing one’s life means working for others, even though they don’t pay us back. It means doing a favor without it being returned. Losing one’s life means jumping in even when failure is the likely outcome— and doing it without being overly prudent. It means burning bridges for the sake of our neighbor. Losing one’s life should not be accompanied by pompous or dramatic gestures. Life is to be given simply, without fanfare— like a waterfall, like a mother nursing her child, like the humble sweat of the sower of seed. These two quotes express the challenge of Jesus’ call to be like the grain of wheat. Meditating on this Gospel and the two commentaries of martyrs will be a good discipline for me in these last two weeks of Lent. The quotation from Romero, from The Violence of Love, is reprinted from www.bruderhof.com. Copyright 2003 by The Bruderhof Foundation, Inc. Used with permission. so that his name will be spoken no more. In a few days we will celebrate the 35th anniversary of the martyrdom of Blessed Monseñor Romero, the archbishop killed at the altar on March 24, 1980. Yet a few days before his martyrdom, a Jesuit missionary from Catalonia, in Spain, was abducted and killed in Bolivia. 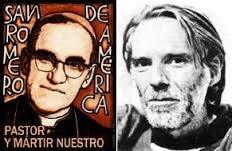 Father Luis Espinal, Padre Lucho, was abducted from a jeep in La Paz Bolivia in the evening of March 21, 1980. He was tortured in El Alto, near La Paz, and his bullet-ridden body was found the next day. Luis Espinal was a print and television journalist, as well as a movie critic. His work revealed the oppression and injustice at the root of the Bolivian political and social system of his day. His assassins tried to silence his voice, as they often try to silence the voices of truth and justice. Father Luis Espinal’s martyrdom has been overshadowed by that of Monseñor Romero but his witness and his words can inspire us to live the truth of the Gospel in our daily life – no matter the cost. Everyone speaks to us of prudence, Lord, but of a prudence that is not yours, that we search for in vain in your Gospel. Jesus Christ, we give you thanks because You did not stay silent so as to avoid the cross, because You lashed out at the powerful, knowing that You were gambling with Your life…. You do not want a prudence that leads to omission and that makes imprisonment impossible for us. The terrible prudence of stilling the shouts of the hungry and the oppressed…. It is not prudent to ‘sell all that you have and give it to the poor.’ It is imprudent to give one’s life for one’s God and for one’s brothers and sisters. May God give all of us the true prudence that give us the courage to stand up for justice and not the “prudence” of the world that keeps us silent in the face of suffering. My dear Lady,… this I beg you, entrust your mission to one of the important persons who is well known, respected, and esteemed, so that they may believe him. You know that I am a nobody, a nothing, a coward, a pile of old sticks… You have sent me to walk in places I do not belong. Forgive me and please do not be angry with me, my Lady and Mistress. On December 9, 1531, a Christian from the Chichimeca tribe, Juan Diego Cuatitlatoatzin (“the talking eagle”), was called by the Virgin. She told him to go to the bishop and ask that a church be constructed on the hill of Tepeyac. The bishop was skeptical, to put it mildly. But several days later the Virgin had Juan Diego gather roses in his tilma, his cloak, to show the bishop a sign. But an even more impressive sign was the image of the Virgin imprinted on his tilma, the image we now know as the Virgin of Guadalupe. “Who would listen to an ‘indio,’ an Indian?” some would say. What can one of those uneducated savages teach us, who have been trained in the schools and churches of Europe? But said to say they also sometime get this message from the church. I have heard radical priests denigrate the poor because they don’t understand things. But the message of the Virgin of Guadalupe is that God speaks to us through the poor. Sometimes those with the least education are those who can show us the wisdom of God. I thank you, Father, Lord of heaven and earth, that you have hidden these things from the wise and learned and have reveled them to the simple. Today, Lord, help me to listen to the little ones, so that I may hear your voice and respond in love, as Juan Diego responded to the call of Your Mother. These words from the Constitution of the Society of Jesus, the Jesuits, were written in the 1970s. They were prophetic words in light of the Jesuits killed in many parts of the world. 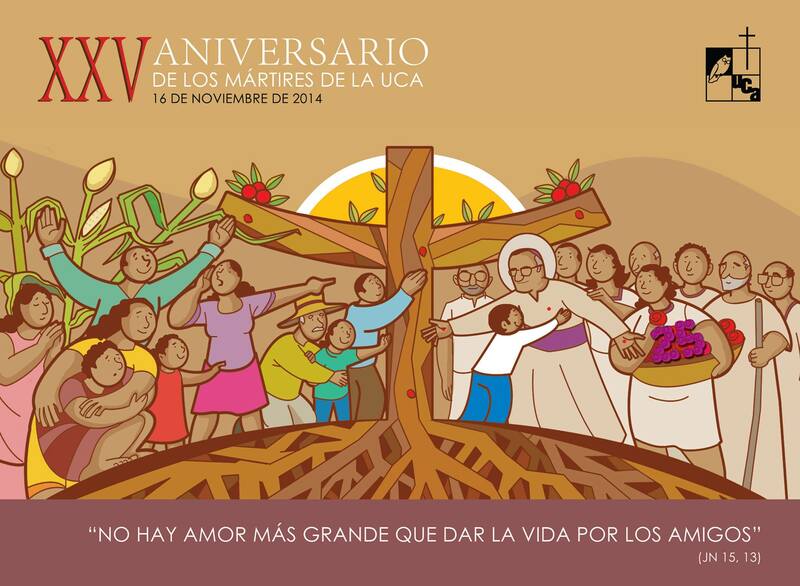 Tomorrow is the twenty-fifth anniversary of the Jesuit martyrs of San Salvador Central American University (UCA) who were killed by Salvadoran military forces who were trained and financed by the United States. 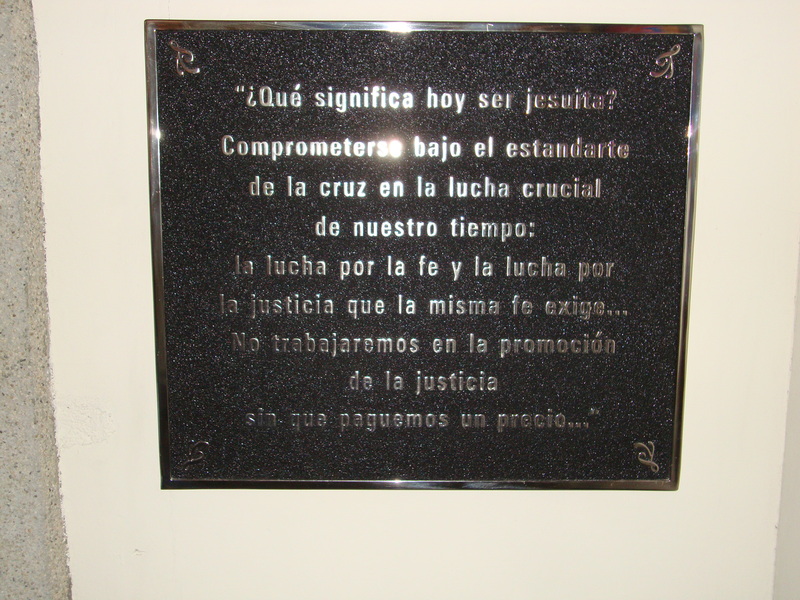 A plaque with the above words from the Jesuit Constitution graces the wall in the UCA chapel where they are buried. But dying while seeking justice is not just a recent experience of the Jesuits. Today is the anniversary of the killing of two Jesuits in Paraguay, Saints Roque González and Alonso Rodríguez, who were working among the Guarani in the Jesuit “reductions,” places of refuge for the native peoples. Though they were killed by chiefs who saw them as agents of the colonial exploiters, they had given their lives for the marginalized and often enslaved Guarani. The struggle for faith and the struggle for justice are not separate; they are part of the same endeavor to live as members of the Kingdom of God. We need to show people the loving God we worship but we also need to accompany them in their efforts to live as children of that loving God. It is not always easy and sometimes comes at a step cost. But God calls us to commit ourselves under the banner of the Cross, a banner of love, of mercy, of justice, of self-giving.